Danggogae Park has a top-notch rock climbing wall, adequate badminton courts, and access to an underrated mountain (Suraksan). 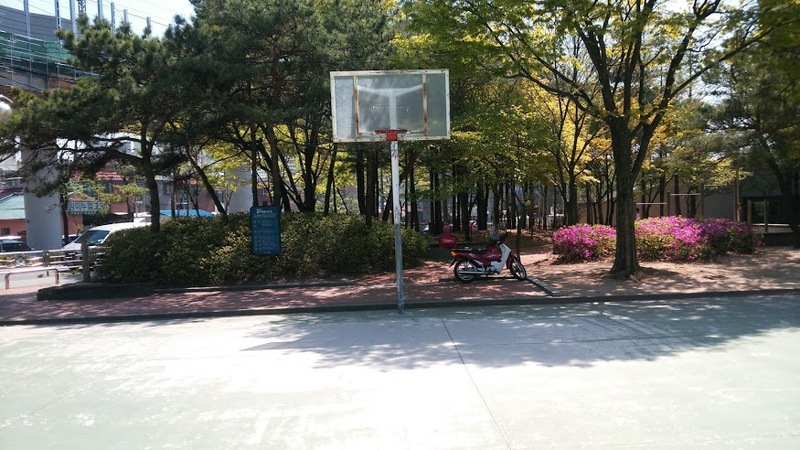 However, its basketball courts and hoops have been neglected and overlooked for some reason. They have quite a bit of wear and tear. Their only saving grace is the chain mesh that hangs from the rims. Straight up 'thug-life'! 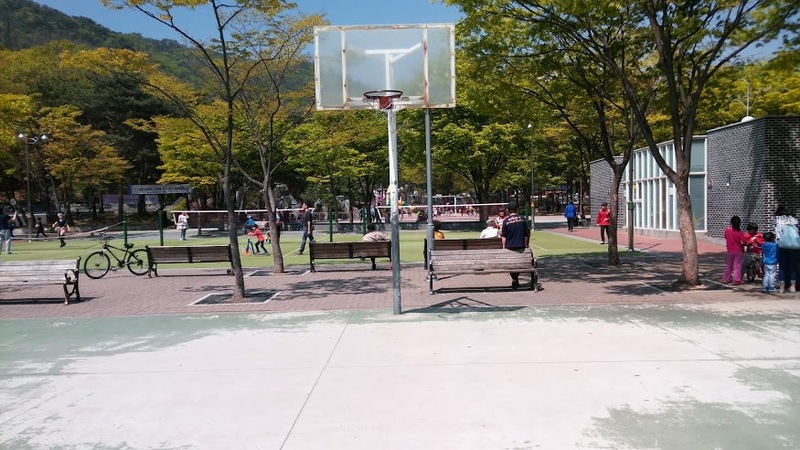 If you are looking for a place to play basketball in northeast Seoul, there are probably better places than the courts at Danggogae Park. 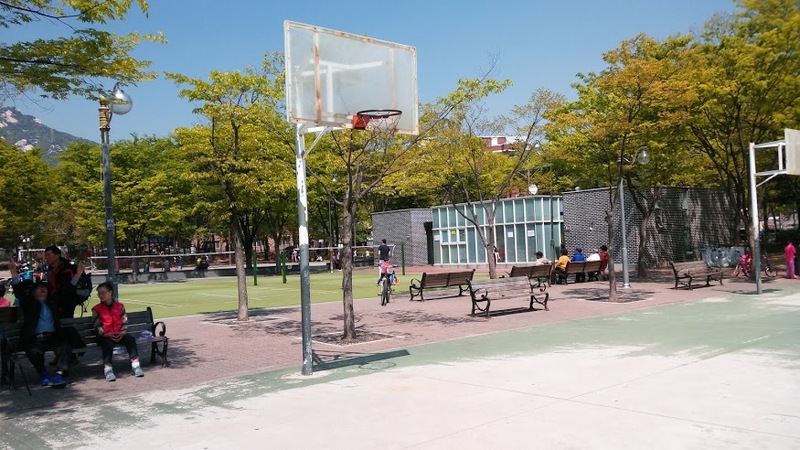 However, if you don't care much for the quality of the courts and merely want a place to shoot around and have fun, then go right ahead and enjoy the park's courts. Green asphalt that is slowly becoming white. A lot of the boundary markings have withered away. Players don't know if they're following NCAA, NBA, KBL or FIBA regulations. There are two full courts, so don't be worried about getting playing time. The backboards are fiberglass and the nets have a chain mesh. If you grew up playing with chain mesh, this is a nice little throwback. 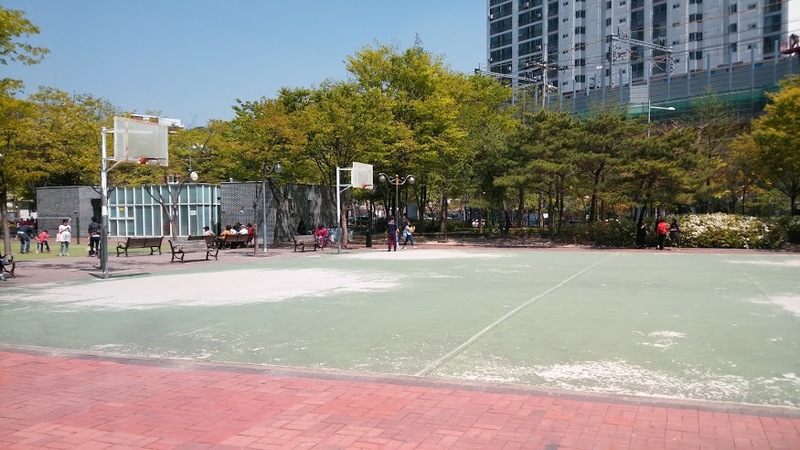 Although no players were found on the particular Saturday afternoon these courts were being scouted, the wear and tear suggests that these either were or are popular courts. If you have information on this matter, please email us. There is a lack of lighting around the courts. There wasn't too much action on a Saturday afternoon. Most of the boundaries are hard to see, so be prepared for an arcade-style game. Some of the nearby rock climbers bring their tents and mats and cook up their own post-climb meals. There are also plenty of restaurant options close to the park. If you're in the mood for some drinks, Nowon Station has a lively nightlife around it. Check out the Danggogae Park photo album to see more pictures of the area. -Walk out of exit 3. Walk straight for 80 meters and the park will be on your right. The basketball courts are right in front of the rock climbing wall.